In the previous section, we talked about the most common reasons why a roofing system would fail or become damaged. The problems that may vary in type and severity, but have one important thing in common: it is imperative that they be addressed immediately. In this post, we’ll take a look at the potential risks of neglecting those very issues. When you neglect even the smallest roof problem, it’s bound to eventually grow bigger and lead to leaks. Leaks often take a long time before manifesting themselves, making it more difficult to pinpoint the source. In all likelihood, it will have caused irreparable damage to other parts of the roof itself (especially true if you have a multi-layered roof) or to other parts of the home. Leaks make way for water penetration, leading to water and moisture damage in the home. 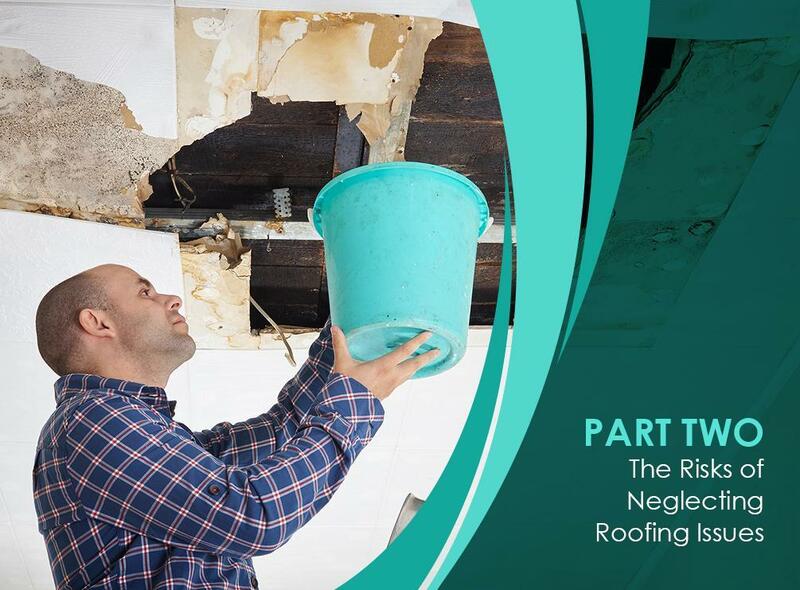 Inefficient gutters, wet attic insulation and roof layers, and other water-related damage caused by roofing problems can cause moisture buildup that can lead to other issues, such as mold growth, condensation and structural weakening. When your roof system becomes weak, it becomes easily penetrable by animals and pests, such as rodents, birds and termites, to name a few. They can build nests and live in and on the roof structure, and even infest your very home. The same holes on your roof that let water in also let warm air in during summer and out during winter, making it harder for your cooling and heating systems to make your home comfortable throughout the year. As they work harder, your energy bills will spike upwards, too. As you continue to delay roof repair, the problems become bigger, harder and more expensive to solve. Not to mention, the cost of building materials, including roofing products, may also increase with the passing years. This is especially crucial if you are thinking about putting your property up for sale, whether immediately or in the future. No buyer wants to deal with a leaky and damaged roof, so a bad roof can certainly affect your home’s resale value. By now, you probably already have an idea what you will be facing if you do not address roofing issues right away. In the next post, we’ll talk about the importance of various roofing jobs.